The 2014 NBA playoffs are just underway, and while it may be unwise to jump to conclusions as to which teams will ultimately reach the finals, fan loyalty turns out to be much more than just the teams’ win-loss ratios. This is the 22nd annual fan survey conducted by Brand Keys, Inc. (brandkeys.com) the New York-based brand and customer loyalty research consultancy. How well a team does, sure. But even more importantly than a win-loss ratio, how exciting is their play? Teams don’t leap to the top of the loyalty roster just because they win a playoff or a championship. It adds to the loyalty bond, but you need the complete package. How well they play as a team. Sometimes a new stadium and, often, new coaches, can help lift this driver. Which brands sponsor the team can matter here as well. Good or bad behavior by an owner shows up here too. Sometimes precipitously like the current Clippers situation, and while the world has taken to more-and-more mobile viewing, this is the driver most-connected to actual game attendance and ticket purchases. Are there players ­– the more the better – that are particularly respected and admired? Usually for more than just their ability to sink a 3-point shot. If you have to think about who that might be on your team, or can only come up with one, your team’s Fan Bonding is likely low. Yes, we know that all these players are supposed to be the best of the best, but the roster of players that fans really bond with is relatively small. Has the game and the team become part of fans’ and community’s rituals, institutions, and beliefs? 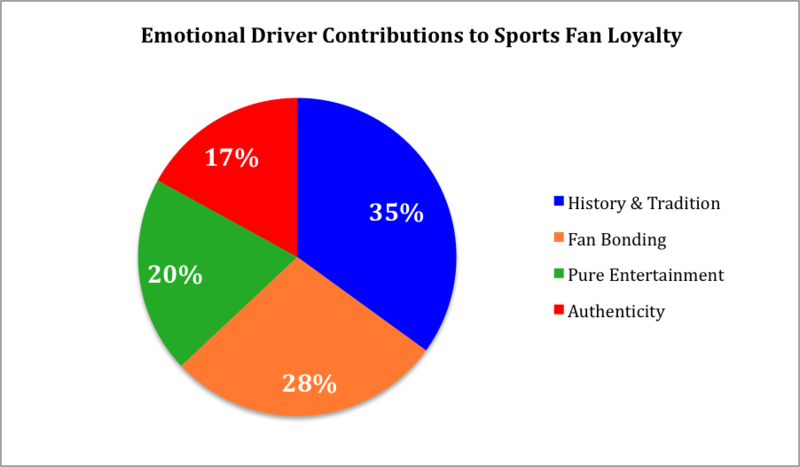 This is one of the strongest drivers when it comes to fan loyalty in Major League Sports. For some teams it accounts for the lion’s share of loyalty they possess. Think about a team like the Utah Jazz, only a reasonable level of History & Tradition keeps them out of the bottom-5. Teams need to meet some minimum levels on all four factors to create reasonable levels of fan loyalty. If one of those drivers weakens, or even disappears, so do high levels of loyalty. Want proof? This is no more obvious than the recent fall from grace of the L.A. Clippers in the wake of reports of racially insensitive comments attributed to team owner, Donald Sterling. Two weeks ago the Clippers were riding high in the 2014 Brand Keys Sports Loyalty Index. The team was winning games, they had reasonably high “Authenticity,” and they had players like Blake Griffin that fans could bond with, along with high marks as being part of the L.A. community. Had Sterling kept his mouth shut they would have come into this year’s SLI ranked #4 in the NBA for loyalty. But, an audio recording of the team’s owner chastising a woman for appearing in public with Magic Johnson, followed by a request to not publically associate with black people or bring black people to games blew up Clipper Authenticity. If you think of Authenticity as one of the four legs of a table that supports fan loyalty, just think what happens if you yank one leg out from under it. Right, it falls down. The Clippers are currently ranked #11. It’s not only fans that are affected either. Clippers sponsors like Aquahydrate, CarMax, Kia, Red Bull, State Farm, and Virgin America all immediately distanced themselves from the team, either ending or suspending team-related advertising and sponsorship activities. And, yes, you can call it “PC” or “PR” if you want, but that’s what happens when a team’s Authenticity disappears like it did here. Sure, the NBA Commissioner Adam Silver came down hard on Sterling. He banned him for life from the NBA, and recommended that owners vote him out in response to his racist comments. The Commissioner says he’ll try to force the controversial owner to sell the franchise. Oh, and Sterling was also fined $2.5 million. So everybody feel better? Probably a little, but in the same way that winning a championship doesn’t launch a team right to the top of the loyalty list, neither do bans and fines return a team to full – in this case – Authenticity. Only time will tell, and who precisely replaces Mr. Sterling could turn the Clippers into the belles of basketball. From an “Authenticity” POV, that is. The NBA again this year ranks 3rd of the four Major League Sports Brand Keys tracks. The National Football League is currently 1st, followed by Major League Baseball. The National Hockey League comes in last. Overall league and team rankings – no matter which league – correlate with viewership and merchandise sales and ticket sales, and since rankings can be influenced depending upon how loyalty drivers are managed, it’s critical that team marketers are as strategic as the coaches. It’s a pretty fair bet that the manner in which the NBA managed the Clippers situation will have positive effects on where the league ranks next year. NBA great, and the new New York Knicks President, Phil Jackson, noted, “Not only is there more to life than basketball, there’s a lot more to basketball than basketball.” The “lot more” he was referring to are what drives teams and what drives loyalty too. The Clippers are seeing that in action right now. But for teams with high fan emotional scores, it's always a win-win.